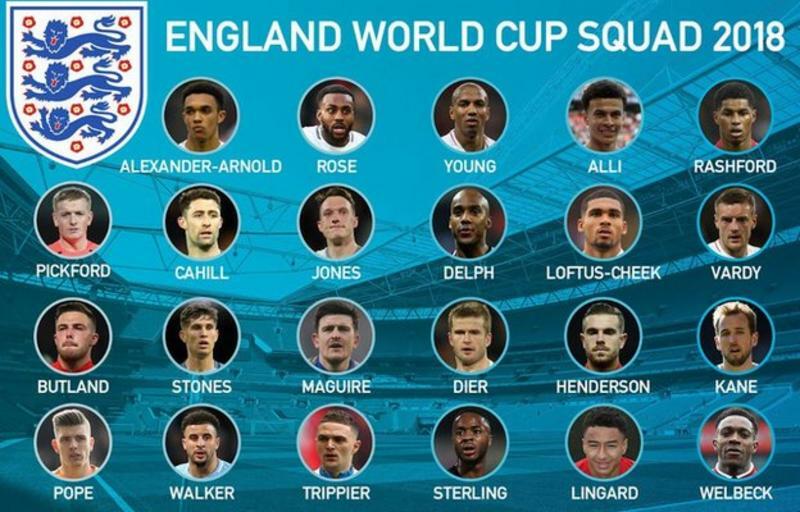 Uncapped 19-year-old Liverpool defender Trent Alexander-Arnold has been named in Gareth Southgate's 23-man England squad for this summer's World Cup. Defender Gary Cahill has been recalled and there are also places on the plane to Russia for Chelsea team-mate Ruben Loftus-Cheek and Burnley goalkeeper Nick Pope. Goalkeeper Joe Hart and midfielder Jack Wilshere have not been included, along with left-back Ryan Bertrand. England start their Group G campaign against Tunisia on 18 June, before games against Panama and Belgium. Liverpool midfielder Adam Lallana is one of five players on standby for the tournament, along with Burnley keeper Tom Heaton, Clarets defender James Tarkowski, Bournemouth's Lewis Cook and fellow midfielder Jake Livermore of West Brom. "I believe this is a squad we can be excited about," Southgate said. "It is a young group but with some really important senior players, so I feel the balance of the squad is good, both in terms of its experience, its character and also the positional balance." Standby: Lewis Cook (Bournemouth), Tom Heaton (Burnley), Adam Lallana (Liverpool), Jake Livermore (West Brom), James Tarkowski (Burnley). Good luck to the lads. Had high hopes for Southgate when he took charge he promised to take a fresh approach but same old names picked on who they play for rather than form. Loftus Cheek and Stones is that really the best we can do? I was half expecting Jake Livermore! Nick Pope is clearly the best goalkeeper, but I am not sure about his ability to hold his nerve in such a big tournament with such little experience. on the one hand you want England to play just like Italia 90 it was brilliant. However we all know they are crap playing out of date boring football with possibly a manager even more boring than Hodgson. Should fit in well then seeing as England are used to being a bunch of bottlers. I tottaly agree, we've no chance anyway so let's get our home team players back safe and sound. What about Egypt? They have our best player. Personally I hope Egypt have a good world cup. I get your point mate but I’m in the other hand hope all our players do well in the WC and go pass the group stages, no injuries of course. Pretty sure for Mo would be fantastic to hin Egipt have a decent run in the WC, and same for all our other players in other teams too. I for one don’t care who wins it, don’t think my country will even get a win, but it’s something special for the players, so hopefully they all have fun and of course no injuries. Of course the best news England wise for this world cup is no world cup song, hallelujah ! The Germans, it's always the Germans!! Apart from Rib does anyone even care what happens to England. Grown out of supporting England a long time ago and in fact even went through a stage in my twenties where I would first pump a win for the opposition. Not bothered either way now, although the response to a England loss is usually pure comedy from the press and like. Will always watch the WC or Euro’s to hopefully see some decent football but being associated with a team who have had the likes of Terry, Neville and Beckham and who lets face it are followed by a bunch of racist Neanderthals, nah not for me. Love watching the world cup footy, what's not to like about a month long festival with footy on everyday, I just can't be arsed getting worked up about the three lions. probably 20 years ago was the last time it was worth watching England. When they moved around the country it was a sell out with much better support. Same feelings as above for me. I don’t actively root against England, I just don’t give a sh*t. Something about following a team where the fans are 16 stone, 55 year old men with their face painted in England colours that just doesn’t do it for me. Actually would like to see Argentina win it so Messi can have a World Cup in his locker, would be great to see one player really drag a team to victory. As it goes...France are my pick.